Some people say that September 1st is unofficially Fall, which I’m ok with since its my favorite season. I decided to make a Fall bucket list of some fun fall activities. Jump In a Pile of Leaves-Brylee did this last year and had so much fun. Go to the Pumpkin Patch-We missed this last year and I was kind of bummed, hopefully we can go a few times this year! Carve Pumpkins-Fun Fact: I cannot stand the feeling of pumpkin guts on my hand and rubbing them onto newspaper to get it off-its totally nails on a chalkboard for me! Make Halloween Costumes-We are doing a family themed costume this year and Brylee picked out who we are going as. They should be an easy costume to make! Go Trick-Or-Treating-Brylee had so much fun last year and I’m sure this year will be even better. I did end up buying this for her last year so hopefully we can start that as a fun new tradition. Make All The Things Pumpkin- Fun Fact: I hate pumpkin. I don’t like PSL, I don’t like pumpkin pie, I don’t like pumpkin anything, but Dustin and Brylee love it. So I’m hoping to find some fun pancake, bread, and muffin recipes for them. Go to an Apple Orchard-I have never been to one but would love to. I would love to pick loads of apples to make pies, applesauce, and even caramel apples with. 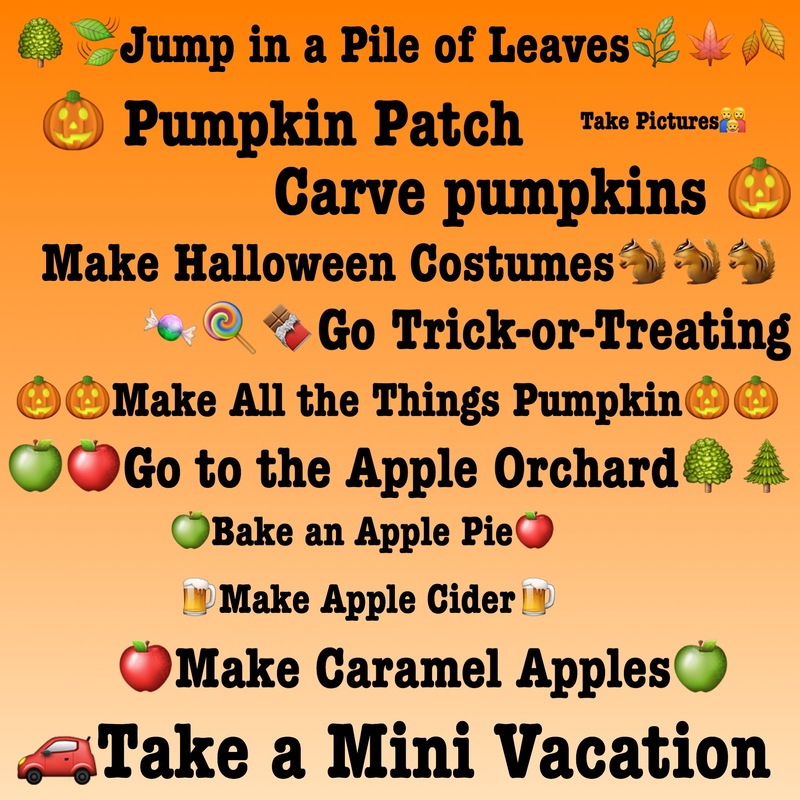 Take a Mini Vacation-I would love to take a mini vacation to Minneapolis or Duluth this fall and take in all the fun sites! Anything else that we should add to our list?! PS How adorable are these? !